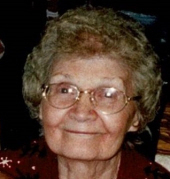 Helen V. Lynn, 94, of Ligonier, died Friday, in Twin Lakes Rehabilitation and Health Care, Greensburg. She was born November 29, 1924 in Fairfield Twp., a daughter of the late Joseph and Gertrude Blair Lynn. Prior to her retirement she had been employed by the former Mt. View Inn. Helen's family and friends were her greatest passion. In addition to her parents she was preceded in death a son, Edward Clair Lundquist, Jr., a sister, Mary Johnston, and four brothers, Blair, George "Rip", Glenn, and Amos Lynn. Helen is survived by two daughters, Connie J. (Jim) McCreery of Latrobe and Donna L. Puchic of Elgin, SC, four grandchildren, Mike (Dana) McCreery, Brian (Susie) McCreery, Terisa (Jeff) Underwood, and Eric (Tina) Pushic, six great grandchildren, Heather, Jesse, Jim and Matthew McCreery, and Blake and Wyatt Underwood, and two sisters, Jean (Jim) Bower of Latrobe and Margie Murphy of New Florence. Friends will be received Tuesday from 2-4 and 6-8PM at the J. Paul McCracken Funeral Chapel, Inc. 144 East Main Street, Ligonier, where Helen's life will be celebrated Wednesday at 11:00AM with the Rev. Dr. J. Paul McCracken officiating. Interment will follow in the Ligonier Valley Cemetery. Memorial contributions, if desired, may be made in Helen's memory to the charity of one's choice. To send flowers or a remembrance gift to the family of Helen V. Lynn, please visit our Tribute Store. "Email Address" would like to share the life celebration of Helen V. Lynn. Click on the "link" to go to share a favorite memory or leave a condolence message for the family.